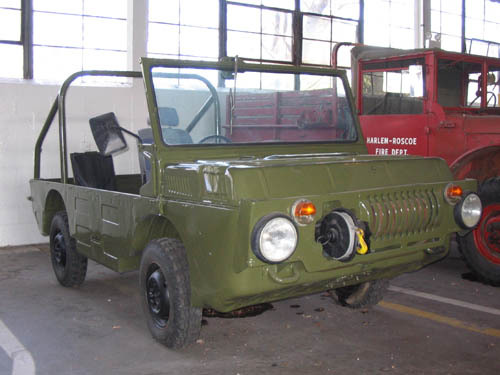 The Luaz (“Lutskiy Automobilny Zavod”) was founded in 1967 in Ukraine. It is an automotive factory with the specific task of producing small-displacement jeeps. The main model produced by Luaz was the “969-m.” Interestingly, the first version of this car (“969-a”) was produced in 1965 by Zaz. The “967” amphibious which you see here was produced exclusively for the Soviet army. It was often the first line of defense as the vehicle can be driven while lying on your stomach (while bullets whiz by). There are two additional removable seats for the driver and medical orderlies. The Luaz was designed to carry ladders, stretchers for two injured, shovel, axe, and first-aid kit. The front features a winch for self-recovery when stuck in the mud or the injured could grab the rope and be pulled to the vehicle. Propulsion in water is accomplished by the movement of the wheels.